Food Costs > How Much Does Peanut Butter Cost? How Much Does Peanut Butter Cost? Peanut butter is a type of food paste, primarily made from grounded dry roasted peanuts. Peanut butter is primarily used as a sandwich spread; however, it can be used in many other recipes such as peanut butter cookies or even on celery. The price for peanut butter can be different depending on the number of ounces in a jar, the type of peanut butter, brand, the market conditions and where it’s purchased. On average, peanut butter can cost anywhere from $2 to $15 per jar. A 64-ounce jar can cost anywhere from $7 to $11 per jar, while a 15-ounce jar can cost anywhere from $2 to $5. An organic peanut butter that contains no hydrogenated oils or any other artificial flavors can cost anywhere from $2 to $6 per jar. For example, the popular Skippy Peanut Butter retails for $2 to $4. An organic brand such as the Powdered Peanut Butter manufactured by PB2 retails for $8 to $15 per jar. The two most common types you will find on the market includes crunchy or creamy. In a crunchy peanut butter, grounded peanut fragments will be left in to give it an extra texture, while a smooth version will be grounded uniformly to create a “smooth” texture. In the United States, in order to be labeled “peanut butter,” the product must contain at least 90 percent peanuts. No product in the United States can contain artificial sweeteners, chemical preservations or coloring additives. Organic peanut butter will not contain ingredients such as partially hydrolyzed oil. Instead, this type of peanut butter contains 100% all-natural products, usually just peanuts and salt. Non-organic peanut butter may contain sweeteners, emulsifiers or a combination of both. Organic peanut butter will cost an average of 30% more due to processing costs. For those who want to make their own peanut butter, peanut butter makers can be purchased, and most makers can range anywhere from $20 to as much as $200. This is all going to depend on the machine, the features and brand. Peanut butter is an excellent source of dietary fiber, protein, vitamin E, niacin and vitamin B6. It’s also high in magnesium, phosphorus, zinc and copper. In a jar of peanut butter, there is about 188 calories per two tablespoons. A very good peanut butter should have two simple ingredients, according to Eat This: peanuts and a bit of salt. Even if the label says “all natural,” it’s still safe to check the ingredients to ensure it’s an organic product. Does peanut butter have gluten in it? According to the National Peanut Board, peanuts, including peanut butter, are naturally gluten-free foods. TheKitchn.com says it may be wise to skip the peanut butter and consider making your own, or if at all possible, buy the natural version. 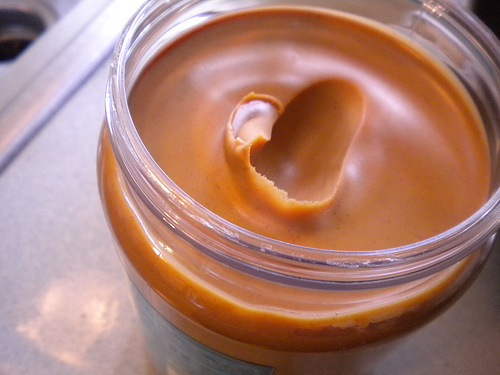 To save money, larger jars of peanut butter can be cheaper per ounce than the smaller ones. You may want to consider buying in bulk since peanut butter has a long shelf life. Consider shopping with wholesale clubs such as Costco or Sam’s Club. Many major brands often include coupons in the Sunday paper and on their official website. Be sure to look for these coupons in order to save upwards of $1 to $2 off a jar. Store-branded peanut butter can often have the same ingredients as the name brands, but it can be up to 30 percent less.